Two Thousand One Hundred and Forty Six Errors!! I must buy their non-functional software for $19.95 which will be charged to my credit card on a recurring basis. 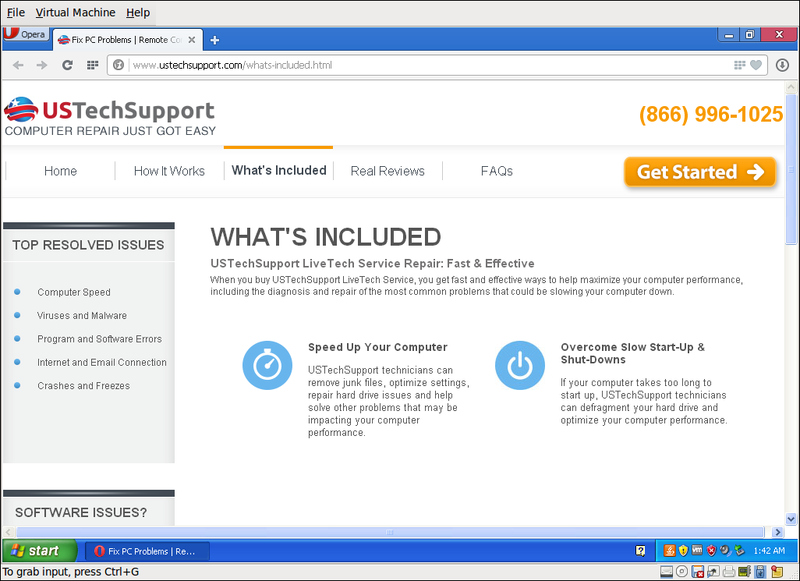 If this useless (most likely) software does not fix my computer, I can place a call to USTechSupport where they will extract much larger sums of money from me for useless tech support. I’ve seen some of their work on the computers of some of my newest customers. My advice, of course, is to be very careful. Snake oil isn’t sold exclusively on the net. If you’re interested in methods for avoiding or quickly recovering from malware or scamware, you might be interested in the video below. My favorite method is to use Linux for nearly all of my browsing, while keeping Windows running as a virtual machine on the Linux host. It’s not perfect, but it’s worked very well for me so far. Another method is to use Windows as the host OS, but only browse the net using the browser in a Linux virtual machine. This is like having a nearly bulletproof browser in Windows.